Garnier as become one of my favourite skin care brands ever since the moisture bomb range came into my life. For someone with a very dry, dull skin, finding the perfect moisturizer that leaves your skin glowing and super hydrated is a life goal that sometimes is hard to achieve. 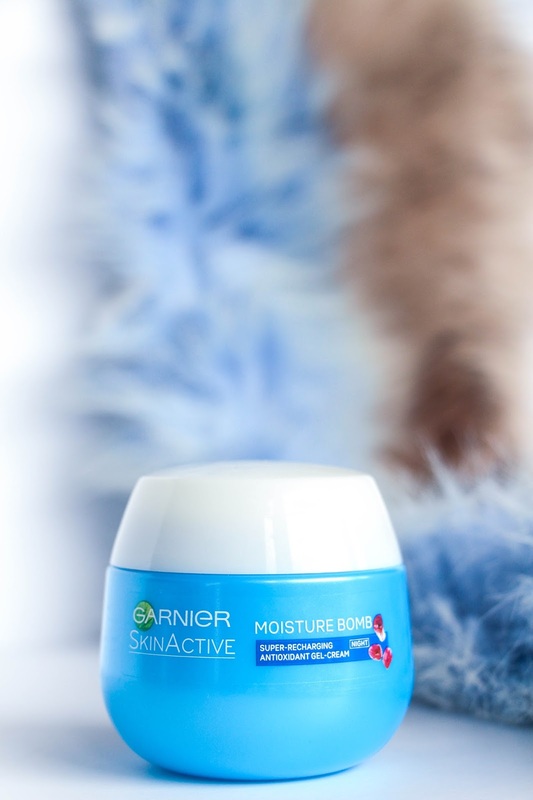 I have tried many moisturizers that I, at the time, thought were working quite well but after trying the Garnier Moisture Bomb I never looked back and unless something amazing comes out, I don’t think I ever will. The Garnier SkinActive Moisture Bomb moisturizers were my first purchase of this range. Funny thing is that I wasn’t even looking for anything new but as I was going to the check-out, I saw both day and night moisturizer in a shelf and decided to give it a go – and I am glad I did! 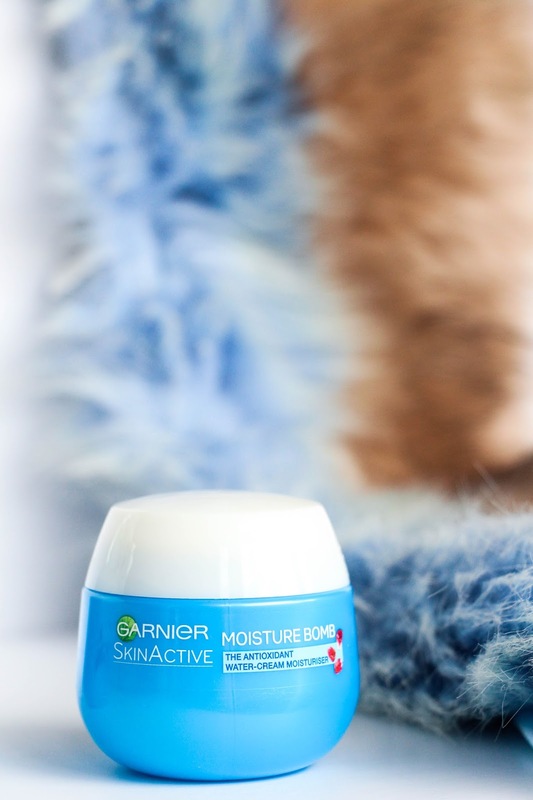 The Garnier SkinActive Moisture Bomb Water-Cream Day Moisturizer as such a smooth and light consistency that you wouldn’t have thought that it had such powerful hydrating skills. I apply this (almost) every morning, after getting out of bed and washing my face with cold water. When applying it, it does feel very watery and fresh and I absolutely love that. It sinks into my skin pretty quickly leaving it very smooth and hydrated. This also leaves my skin well prepared for makeup application. I tend to leave it on for at least 20 minutes before putting anything else on my skin. I have noticed that after I started using this product, my makeup applies easier and much better. Everything just glides so easily on my skin as it is always so hydrated and smooth!. The Garnier SkinActuve Moisture Bomb Night Cream is definitely something from another world. The first time I opened I was quite surprised and intrigued as this has more of a gel texture and feel. I wasn’t convinced just by looking at it. Yet, as soon as I tried it, I was really impressed. It feels like water on my skin and I do love that about it. It isn’t greasy at all and you only need a very small amount too, which makes it last ages. I try to apply it a few minutes before going to bed as I don’t want to waste the product by leaving it all in my pillow. It does sink into your skin quickly so no excuses at all! After applying it the first night, my skin had another feel to it. Again, it was so smooth that I could not not be impressed by it. These are the second ones I bought and I know there will be more after this. I also never go on holiday without it, specially during this summer time. My skin can get so dry during summer and these two products along with the tissue mask saved it all! This is the secret of a perfectly hydrated skin. I don’t think I have ever tried such a moisturizing tissue mask at such an affordable price! I am absolutely addicted to it. 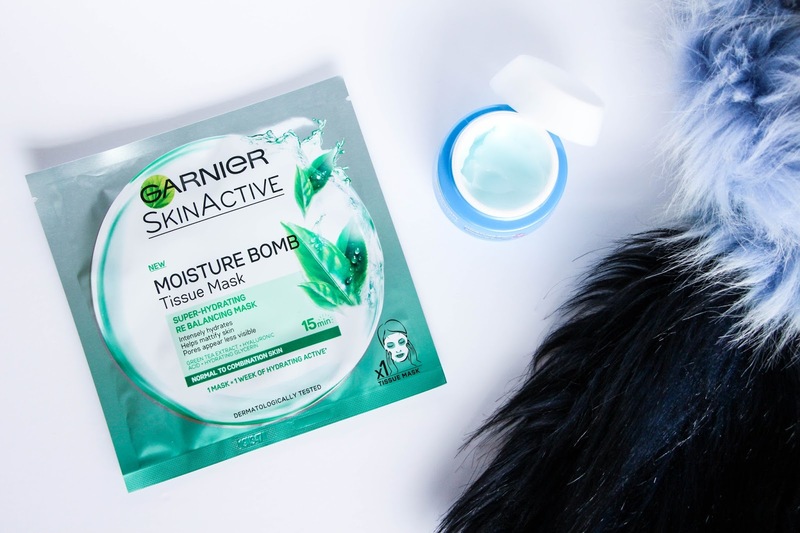 The Garnier SkinActive Moisture Bomb Tissue Mask is to die for! It is water in a tissue, literally. It feels so weird at first but leave it on your skin for 15 minutes and just feel the magic happen – and see it when you remove the face mask. When you do remove the tissue, you still have a lot of product on your skin. I normally massage it a little and then just leave it to sink in and it feels absolutely amazing. I normally go for the blue one and not the one in the picture (I had this one at home left from a pajama party with my girl friends) as it is suitable for dehydrated skin and that screams my name! I try to do it once a week as I feel like it does work for me and I also do my best to apply the moisturizer every morning and night but I do admit that I can be a bit lazy with it! If you never tried it, please give a go to the tissue masks specially if you have dry skin! These three products have been my secret for my dry, dull skin and I do believe people notice it as I get more compliments about my makeup and I am not using anything different apart from these three products. 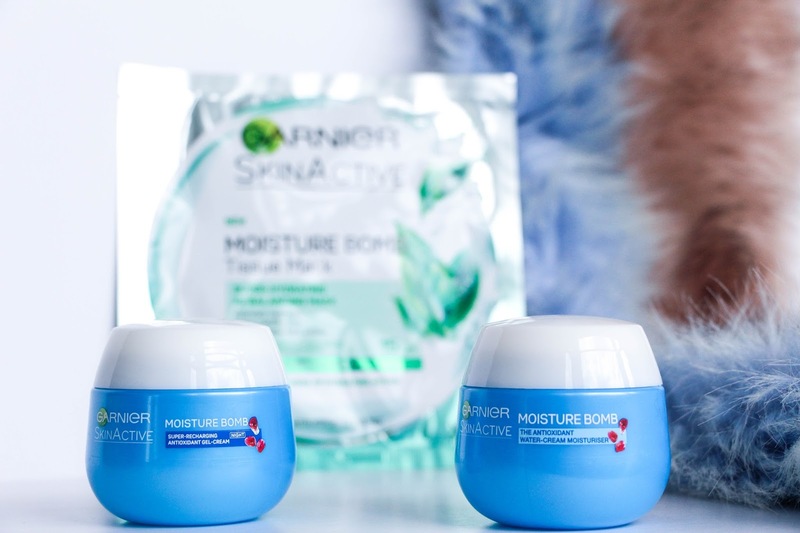 Let me know what you think about the Garnier Moisture Bomb range if you have tried it and leave me suggestions of products for dry skin that you think I must try! Previous Post My Cinderella Story: We’re Engaged!